My book that gave me my first speaking gig. 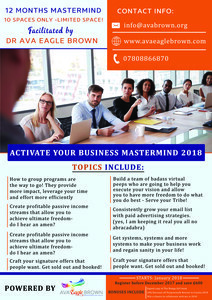 Are you ready to activate your business idea in 2018? Well, if you are, I am ready to hold your hands. You see- my journey started with a book, most of you even forget or don’t know of its existence. It is called Bamboo and Fern. Yes, that was the start of my business. A simple book became what I know will become a more global brand. It was that book that gave me my first speaking gig and started my career as an entrepreneur. Along the way, I have learnt so much, met so many people of impact and influence, build my brand, branded event and a myriad of other business skill set that I want to share with you. That is why I created Activate Your Business Mastermind to hold your hands and help you grow, scale and become profitable. Limited spaces so get on today.